Where Should You Put Your Money These Days? Personally, I’m staying. Sort of. Wise investors tell you not to panic, and as a fund manager myself, I’ve learned the benefits of taking a longer view. But that doesn’t mean you and I should sit tight. I’m directing my own new investments away from Wall Street, and not just away from stocks. Why? The stock market isn’t going to improve much. The Dow and S&P are both down for the year. They may lose more. But there’s plenty of indication that the economy isn’t going to drive a big rebound. You may not lose your shirt in the months to come, but stocks may not do all that much better than your mattress over the next year or two. Suppose you have a portfolio of bonds yielding 3.5%, with an average maturity of ten years. Now suppose interest rates go up about 1.5% from their current very low levels—a reasonable assumption, given the signals the Fed has been making. That means similar, newer bonds yield 5%. Just that small change will cause your bond portfolio to lose almost 12% of its value. Ouch. You now need almost three years just to allow interest payments to make up your losses. So much for bonds. The smart people are going in a new direction. What used to be called “alternative investing”—such as private equity and real estate—doesn’t seem so alternative any more. Harvard has put more than half of its $36 billion-plus endowment in alternatives, with only 11% left in U.S. stocks. Until recently, that would mean nothing to you and me. Federal law prohibited individuals from turning themselves into personal banks. But, thanks to the 2012 JOBS Act, it’s now legal for the rest of us to act like Harvard (with something less than $36 billion, presumably). Here’s what you can—and should—consider doing. 1. Invest in real estate. Yes, real estate. Values have largely recovered, but there are still some attractive opportunities. Depending on where you live, there may be strong income (for example, in the Midwestern U.S.) or neighborhoods that are attracting lots of new investment and improving in major metro areas. Check out rental properties in your own community. Interviewing local Realtors is a good way to learn about how to buy a property and find a good manager. Rental rates are high, and they’re bound to go even higher in the next 5-10 years. That means income. Some of those opportunities entail not buying the real estate itself, but in being the banker. In other words, lending money to someone buying the property. Banks aren’t lending money as much as they used to. As a result, real estate investors and small businesses are having trouble getting loans. You don’t have to make the loans personally—though you can, legally. But your first step might be to find a good lending fund manager open to new investors. Try focusing on firms in your own area by searching for “private money lenders” and “real estate lending funds.” You can also search using the same terms on Meetup and other event sites for local groups. If you want to be a bit less passive, you can purchase loans from specialized brokers who help borrowers to finance their projects. Once again, searching online will help you find such brokers. If you have the expertise and time, you can earn a bit higher returns by finding borrowers directly. To do this, networking is key. The best place to meet borrowers is events in your local area that attract real estate developers. One way to find such events is through the business school at your local universities. Specialized service providers can help you to document your loans properly and also arrange for servicing of the loan. This basically means collecting interest payments from the borrower and taking appropriate actions in case of a default. Why should you be the bank? Being a lender—or investing in a lending fund—insulates you from the rollercoaster ride of the public markets. You don’t need to worry about stock and bond prices, because your money generates income while you sleep. Your investment is secured by buildings and land that will be there even if the markets crash. And here’s the really good part: You can earn a lot more income than most investors. We’re talking a reasonable 7-9% per year in the current market. If you lend too aggressively—putting up too much money relative to the value of the property—then you could lose principal if real estate values fall. And, of course, there’s the risk of fraud. The key is to find a good manager. For starters, check both your state real estate licensing agency and FINRA’s databases for the names of the principals of any fund, to see whether there have been any negative issues. Also don’t forget to do some online searching and to ask around among credible people you know. If you can’t find anyone who knows the company, don’t invest. Besides being a good investment, being the bank lets you help your local economy. You jump start new businesses, help developers improve neighbors, and become a genuine job creator. You get some of your money out of Wall Street and onto Main Street. All while building the future for yourself and your kids. Win-win. Jan Brzeski is Managing Director and Chief Investment Officer at Arixa Capital Advisors, LLC, a real estate investment manager and fund operator focused on balance sheet lending to developers who purchase, renovate and resell single family homes in California. He is the author of the upcoming book, Be the Bank: The Safe, Profitable Alternative to Stocks and Bonds. In January of this year, Los Angeles based firm Oaktree Capital Group LLC (OAK) committed $100 million to Genesis Capital, LLC, a Calabasas based firm in the business of originating private loans to people who fix and flip houses. We recently created a brochure showing some of the finished projects renovated by several of our highly skilled borrowers. Please click here to check it out. Hard money lending, also known as private money lending and bridge lending, occupies an important place in the real estate finance landscape. 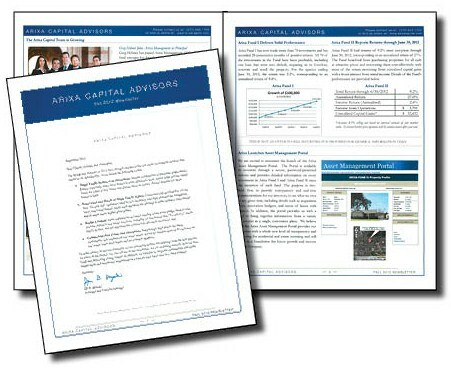 AllAboutAlpha.com is the online publication of the Chartered Alternative Investment Analyst (CAIA) Association. The CAIA is devoted to training investment professionals who focus on alternative asset strategies such as hedge funds, commodities, private equity and real estate. Jan is writing a series of articles about today's real estate investment environment. Because AllAboutAlpha attracts readers from Europe and Asia as well as North America, Jan will curate articles by real estate investment experts from outside the U.S. about which investment strategies are working and why in their respective regions. In Jan's first article, he discusses how yields are compressed for many popular real estate investment strategies, but remain attractive on a risk-adjusted basis for other, less well known strategies. To access Jan's article, "What Los Angeles Traffic Can Teach Us About Investing in Real Estate Today " please click here.